Tonight, Darren and I celebrated our 6th anniversary with a spontaneous dinner at Vij’s. It was one of those meals where you wish you had more room in your tummy to keep eating. If you head there soon, try the cashew and paneer “truffles” entree. So good. Believe it or not, we said no to dessert…because Darren never wants to order to dessert, but mainly because I knew dessert was waiting for us at home. In the freezer. 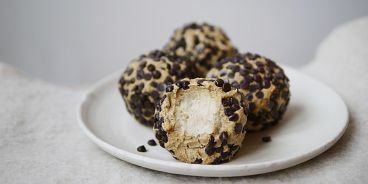 These cookie dough wrapped ice cream balls! Considering how much we ate tonight, these guilt-free balls were the perfect way to finish the evening. And so easy to make. Tweet me if you have any questions about the recipe (@erinireland). 1. Blend your frozen bananas into a smooth puree (“nice cream”) using your high powered blender. 2. Using an ice cream scooper of any size, scoop “ice cream balls” onto a parchment lined baking sheet and place in the freezer immediately. Let freeze until completely solid. 4. Remove rock solid banana ice cream balls from the freezer and, using your hands, wrap each of them with your dough. Roll in chocolate chips immediately and place back in freezer until firm.